Chittagong University 1st year (Hon’s) 2014-2015 Admission Admit Card is to be Download from 21-10-2014. 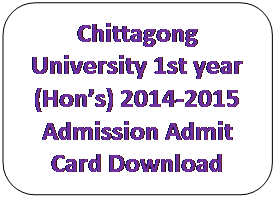 By clicking any one of this link you can download Chittagong University 1st year (Hon’s) 2014-2015 Admission Admit Card. বাংলা প্রেমের গল্প , মিষ্টি গল্প ও অন্যান্য গল্প পড়তে storyinbengali.blogspot.in এর উপর Click করুন.